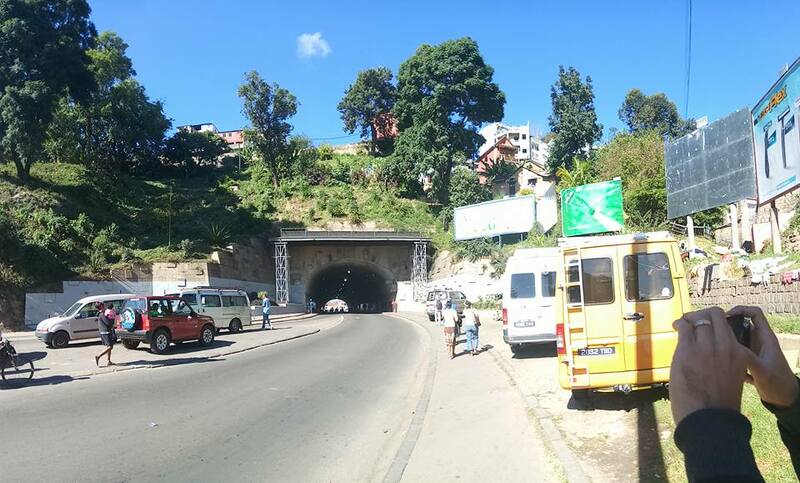 View of Tunnel d'Ambanidia in Antananarivo shared on Facebook by Caleb Landry. Used with his permission. Police in Madagascar's capital has arrested a man suspected of sharing “fake news” about a collapsed tunnel through Facebook. One afternoon in May, alarm spread through Antananarivo in response to a social media post reporting casualties in the collapse of the Tunnel d’Ambanidia. The false report  went viral on social media and through word of mouth as people phoned family and radio stations in a panic. Emergency vehicles, journalists, and city residents rushed to the scene, only to find the tunnel still standing. Facebook user Rovaniaina Hasivelo Randrianarijaona posted a live video  as he walked through the tunnel and showed traffic continuing to pass with no trouble. “Tiako be ilay intox (I really enjoyed the hoax),” he wrote. Une question mérite, à présent, d’avoir une réponse rapide et sérieuse: QUI sont le ou les auteurs de cette désinformation? Car cela fait partie de la cybercriminalité … Son point de départ a été facebook. Est-ce que le service de la police malgache dans ce domaine, est capable se retrouver l’origine ou bien faudra-t-il encore l’expertise de “vazaha”? One question now deserves to be answered quickly and seriously: WHO are the perpetrators of this misinformation? This is cybercrime … Its starting point was Facebook. Is the [cybercrime] service of the Malagasy police capable of finding [the rumor’s] source or will it still need foreign expertise? Police traced the “fake news” post to an IP address and made an arrest within two days. The suspect’s punishment, if any, is yet to be determined. Ramambazafy also recalled the case of Hiary Rapanoelina , a Facebook user in Antananarivo who in February was sentenced to one year in prison for his association with a Facebook group dedicated to gossip about public figures. At the height of its popularity, the now defunct group had more than 70,000 members. Authorities had received complaints from artists and an elected official about content shared in the group and quickly identified Rapanoelina as the group creator and one of the administrators. They arrested him the next day. Rapanoelina was convicted on counts of defamation and in violation of the controversial Article 20 of Law No. 2014-006  to fight cybercrimes, which criminalizes any “insult or defamation” against public officials through electronic media. It remains unclear whether and how the suspect in the Tunnel d’Ambanidia case will be charged. Harinjaka Ratozamana, a key influencer in Madagascar’s internet and startup scenes, said in an interview with RFI  that this was the first time a rumor has spread to such an extent. D’un, nul n'est anonyme derrière son écran! Et de deux, ne prenez pas pour argent comptant tout ce qui se dit sur internet! For one, no one is anonymous behind their screen! And two, don’t take everything that is said on the internet at face value! Mila faizina kely izy mba ho anatra ho an'ny [rehetra] fa tsy fanagadrana kosa angamba ny saziny, fa lamandy ohatra dia mba ampy. Tsy namono olona izy…fa ny dondrona kelin'ny Facebook mora [adalaina]. They need to be punished a bit as an example to [everyone], but maybe the punishment shouldn’t be jail time; a fine for example would be enough. They didn’t kill anyone…it’s stupid Facebook being easily fooled. Elsewhere online, reactions weren't concerned with the possibility or severity of punishment, but with the fact that an arrest was made in the first place. Manahy mafy aho fa kinendry hamerana ny media sosialy iny tsaho iny! Misinformation can have real-life consequences, especially when it is shared widely online. But not all misinformation is equal—the intentions of the speaker, the context in which the post was shared, and the actual consequences that false information carries must be considered carefully. Experts consulted by Pew Research Center about the future of online interactions  warn that moderation comes at a cost , highlighting the delicate balance between countering online violence, hate speech, and “fake news” and safeguarding free expression and access to information. This Ambanidia incident happens amid a growing trend of governments censoring social media or switching off the internet, in what they often justify as an effort to minimize misinformation. In Africa in particular, censorship and shutdowns  are becoming increasingly common around election seasons, with Gabon  and Gambia  being recent examples. While these shutdowns may help curb false news, they also prevent citizens from communicating with one another, to say nothing of obtaining news and information about candidates. Shutdowns have also been known to stymie opposition candidate  efforts to rally support in the final days or hours before a vote. This trend is on the minds of Malagasy citizens, with presidential and parliamentary elections coming up in 2018. As the process unfolds, human rights defenders will keep a close watch on how the sitting government navigates challenges around misinformation, freedom of speech, and online privacy. Will the government take additional steps to prevent or punish viral “fake news”? Time will tell if Madagascar joins the trend of using internet shutdowns to control access to information during elections.